We are one of the leading manufacturers & suppliers of different types of conveyor systems. With us, one can be rest assured of getting quality products at competitive pricing. In our state-of-the-art manufacturing facilities, all types of Conveyor systems, belts, packaging lines etc can be manufactured, allowing us to easily meet the varied requirements of our customers. Bhagwati Automated Conveyor Systems Specialists that will work with you to find the best solution for your product handling process within your budget but maintaining a quality product that will stand the test of time. Designed and Manufactured in our own factory so we can fabricate any type of Conveyor System, Packaging Line, Conveyor Belts bespoke to your individual needs. 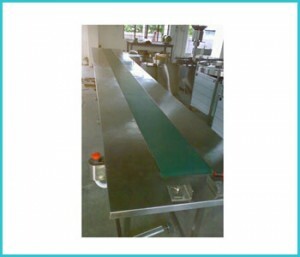 A conveyor belt is used to transport or convey particles, raw materials or finished products from one place to another. It consists of two end pulleys which are powdered by a motor to move the material on the belt forward. Belt conveyors are widely used in agriculture, transport and manufacturing units. These conveying systems are more successful and popular commercially rather than local or personal purpose. A number of machines are equipped with the conveying belt systems for ease of movement of materials and finished products. These machines ensure high level of efficiency in transporting products. Non Woven Belts :These conveying belts are one of the strongest, making use of a single ply of a very strong fabric that is generally interlocked. These belts are tear resistant, cut resistant, impact resistant. Non woven belts hold fasteners better and are less likely to be knocked off the track. Plied Rubber Belts: These belts are manufactured by weaving thin fabric and plying it with different types of natural or synthetic rubber. It is one of the least expensive conveyor belting system having excellent elastomeric properties. Plied Thermoplastic Belts:These belt systems are thinner, stronger more flexible than the other kinds of belts. It is one the recent and modern kind of conveyor belting system in use by various industries. These belts require less horsepower because of thinness. This system essentially makes use of PVC, RMV and polyurethane plastic elastomers. Plastic Modular Belts: These conveying systems are assembled in a bricklayer pattern for providing lateral strength. Modular designing of this system enables easy installation and without using uncomplicated tools or fasteners. Heavy duty Rubber Belts: These conveying belt systems are thick, strong and used for for abrasion and impact resistance.